The supply of new housing in the country’s capital and its suburbs has reached new heights. If over the past five years mainly new apartments have been constructed, so today record indicators of supply in the private house segment are recorded. The development of housing estates with detached and semi-detached houses, which started in 2015–2016, has not slackened its pace. According to Ober-Haus, in 2017 developers in the city of Vilnius and its environs built and offered for sale nearly 590 new houses or as many as 55% more than in 2016, but the plans of developers for this year are even more impressive. 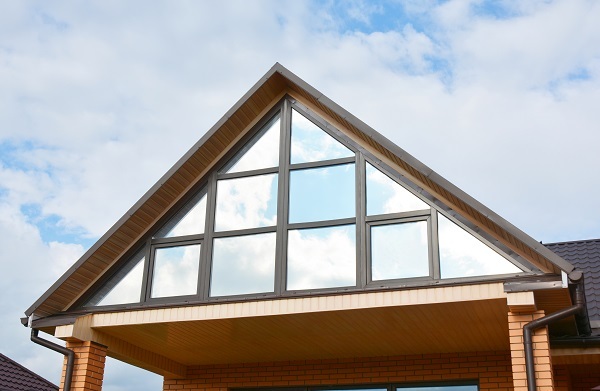 In 2018, they plan to build more detached and semi-detached houses of various sizes totalling up to 850. At the same time the indicators of the annual supply of private houses for sale in 2017 and 2018 have been highest in the entire period since the restoration of Lithuania’s independence (e.g., about 440 private houses were built in the city of Vilnius and its environs for sale in 2007). ‘Although the number of private houses built for sale in Vilnius region cannot match the apartment construction volumes, over the past 3–4 years the pace of development of private houses has been considerably faster and the share of private houses in the total supply of housing has been on the rise,’ Raimondas Reginis, Ober-Haus Research Manager for the Baltics, said. If in 2014 the share of private houses built for sale in the total housing supply (apartments and houses) in the city of Vilnius and its environs accounted for only 6.4%, so in 2017 the figure increased to 12.4%. In 2018, it is planned to build about 4,500 apartments and about 850 houses in the city of Vilnius and its environs, so the share of private houses will be about 16% of all the housing supply. The following zones of the city of Vilnius have seen the fastest development of private houses for sale: the southeast (Pavilnys, Guriai, Kalnėnai) and the northwest (Pilaitė, Buivydiškės, Tarandė). What determined such rapid development of private houses? Of course, one of the main reasons is the increasing number of home buyers in recent years who can afford a larger or more expensive housing. ‘Yet this is not the only reason which has determined development of this housing segment. With rapidly growing competition in the segment of apartments in the multi-apartment buildings, more developers and individual investors have decided to offer an affordable housing option to house buyers. I.e. currently small row houses dominate in the housing development market which offer essential attributes of a private house for an affordable price: a separate entrance to the property, some land, a parking space and a small number of neighbors,’ Mr Reginis said. Of course, over the past 5-7 years, the mandatory dimensions of the houses have changed significantly: the house and the plot of land are relatively small and a parking space only for a single vehicle is provided. The change is particularly visible in the analysis of the total floor area of private houses over the past decade. According to Ober-Haus, the average floor area of the houses built in the housing estates in the suburbs of Vilnius in 2000–2010 was 160-180 sqm, but starting from 2011 a sudden reduction in the floor area has been recorded. For example, the average floor area of the houses built in the housing estates in the suburbs of Vilnius in 2015 was 119 sqm, in 2016 – 113 sqm, and in 2017 – 115 sqm. Comparing the period of 2000–2010 with that of 2011–2017, the average floor area of the houses decreased by 30%. The sizes of house projects also differ: from ultra small 4–6 semi-detached house projects to large housing estates with 100 and more houses developed in stages (e.g., the newly introduced project Baltai in the vicinity of Lentvaris, where about 240 houses [floor area between 87 sqm and 129 sqm] will be built within the next 3–5 years). The development of new houses is also encouraged by their good sales indicators. According to Ober-Haus, 88% of houses built in 2017 were sold and reserved by mid-2018. This is also reflected in the official statistics – according to the State Enterprise Centre of Registers, about 1,200–1,250 houses were purchased each year in the municipal area of Vilnius city and district in 2015–2017, which is the greatest market activity indicator in history. The first half of 2018 was also most active in history (compared with the first half of 2017) when a total of 611 houses were sold. 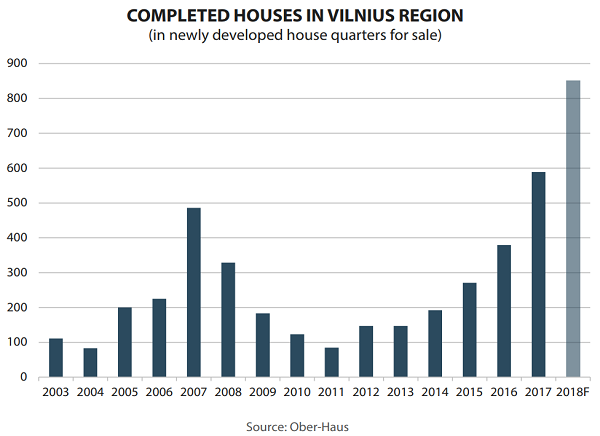 ‘However, even with good sales indicators, large scale construction of new houses has essentially stalled sales prices of houses in Vilnius and its environs. In the first half of 2018 the prices remained unchanged and compared with the same period in 2017 only 1% increase in sales prices was recorded,’ Mr Reginis said.